Diabetes is a very complex condition that results in high blood sugar levels. Type 1 diabetes occurs when the body cannot make enough insulin, and type 2 diabetes occurs when the body fails to use insulin properly. A low-glycemic diet is the most important therapy for regulating blood sugar and reducing the risk of complications. If left untreated, diabetes can increase the risk of many serious conditions, including depression, anxiety, and dementia. In fact, scientific evidence has linked type 2 diabetes with an increased risk of cognitive impairment and dementia, including Alzheimer’s disease. Recently, researchers have also linked type 1 diabetes with dementia. They discovered that type 1 diabetics who are 60 years of age and older have an 83% higher risk of developing dementia. Factors that are thought to increase the risk of dementia include insulin resistance, glycemia, oxidative stress, inflammatory cytokines, advanced glycation end products, and macrovascular and microvascular blood vessel diseases. Researchers have also discovered that glucose is not used properly in the brains of Alzheimer’s disease patients. It may be due to nerve cell death, a process that lowers the brain’s communication abilities. In a brain with Alzheimer’s disease, there is an accumulation of protein beta-amyloid plaques, which are linked to prevent the activity from insulin receptors in the brain. As a result, insulin production is affected, and brain cells become unresponsive to insulin. The diabetes and dementia connection doesn’t end there. In a large 62-study review published in the American Journal of Psychiatry in February 2015, researchers found that diabetics with mild cognitive impairment had a greater risk of dementia. Since diabetes and dementia have such a connection, I was intrigued to learn that diabetic medications may influence the risk of dementia, including Alzheimer’s disease. Study: Can Diabetic Medication Decrease Risk of Dementia? How does diabetic medication reduce the risk of dementia? In a new study published in the journal Annals of Neurology, neurologist Michael Heneka and demographers Gebriele Doblhammer and Anne Fink set out to answer this question. The researchers from the German Center for Neurodegenerative Diseases observed data about medication and diseases between 2004 and 2010. Data was provided by AOK, a public health insurance company from Germany. In total, 145,928 men and women aged 60 and older were included in the study. Researchers found that diabetics could significantly reduce the risk of dementia with pioglitazone—a thiazolidinedione anti-diabetic drug. The best results were noticed when pioglitazone was taken for a minimum of two years. Diabetics taking pioglitazone also developed dementia 47% less often when compared to non-diabetics. Pioglitazone reduces blood sugar by making cells in the body extra sensitive to insulin. It is an anti-inflammatory diabetic medication used in long-term and short-term diabetes treatments in those that can still produce insulin, such as type 2 diabetics. Pioglitazone has also been studied for its protective effect on nerve cells. It can also help remove the harmful protein beta-amyloid plaque accumulation in the brain. Metformin is another widely used type 2 diabetes medication that can control blood sugar levels. In the study, metformin also reduced the dementia risk; however, pioglitazone was considered more effective. 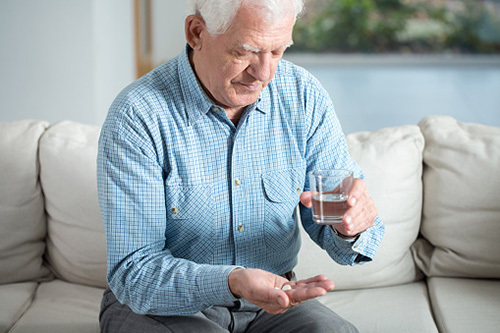 Researchers are yet to determine whether pioglitazone also has a protective effect against dementia in non-diabetics, or if the effect is only restricted to diabetics. Future clinical studies will help investigate that issue. • Healthy diet: An anti-inflammatory diet that is low on the glycemic index is perfect for those at risk for diabetes and dementia. Look for foods that have a glycemic index of 55 or less, or a glycemic load of 10 or less. Foods that are helpful for diabetes and dementia include avocados, ground flaxseed, turmeric, wild salmon, walnuts, coconut oil, and dark green leafy vegetables like kale or spinach. • Exercise: Regular exercise is a good way to maintain optimal blood sugar levels and help prevent dementia. Aim for 30 minutes of moderate-intensity exercise for five days a week. The ideal routine will combine strength training and cardio exercise. Good exercises include swimming and walking. Gardening and cleaning are also good activities to help prevent diabetes and dementia. The addition of two to three strength sessions can also cut the risk of Alzheimer’s disease in people over the age of 65. • Reduce stress: Chronic stress is also linked with diabetes and dementia. It is a good idea to reduce stress whenever possible. Include stress-reducing activities throughout your week, such as spending time in nature (i.e. a walk through a forest). It can help detoxify the body and reduce stress. Yoga, meditation, qigong, and tai chi are other great stress-reducing methods. Heneka, M.T., et al., “Effect of pioglitazone medication on the incidence of dementia,” Annals of Neurology, 2015; 78(2): 284-294. “Diabetes medication reduces dementia risk,” ScienceDaily web site, June 23, 2015; http://www.sciencedaily.com/releases/2015/06/150623114008.htm. Whitmer, R.A., “Type 2 diabetes and risk of cognitive impairment and dementia,” Current Neurology and Neuroscience Reports, 2007; 7(5): 373-380. Bebbington, T., “Diabetes and Dementia May Be Linked,” WebMD web site, February 20, 2015; http://www.webmd.com/alzheimers/news/20150220/diabetes-dementia-linked. “Type 1 Diabetes Linked to Increased Dementia Risk,” Medscape Multispecialty web site, July 23, 2015; http://www.medscape.com/viewarticle/848519#vp_1. “Diabetes and dementia – is there a connection?” Alzheimer Society Canada web site; http://www.alzheimer.ca/en/Research/Alzheimer-s-disease-research/Diabetes-dementia-connection, last accessed August 17, 2015. “Alzheimer’s and Dementia Prevention,” HelpGuide.org; http://www.helpguide.org/articles/alzheimers-dementia/alzheimers-and-dementia-prevention.htm, last accessed August 17, 2015.